Olympic medallist William Fox-Pitt has called the British team for this week's Badminton Horse Trials the best he has been involved with. Fox-Pitt won in Kentucky last month to lead eventing's rankings, while Charlotte Dujardin and Scott Brash rank first in dressage and jumping respectively. "This is as good as it's been for Britain in my time, without a doubt," Fox-Pitt told BBC Sport. The Badminton trials start on Thursday. This year's Badminton boasts a new cross-country course designer for the first time in 25 years, in Italy's Giuseppe Della Chiesa. Fox-Pitt, Dujardin and Brash all won medals at the London games of 2012, but Fox-Pitt believes British eventing can still improve ahead of August's World Equestrian Games. The Games, to be held in Normandy, take place every four years and are the most prestigious championships in equestrian sport after the Olympics. Britain's eventers won team silver at the London Olympics two years ago, but missed out on team medals at last year's major event, the European Championships in Malmo. 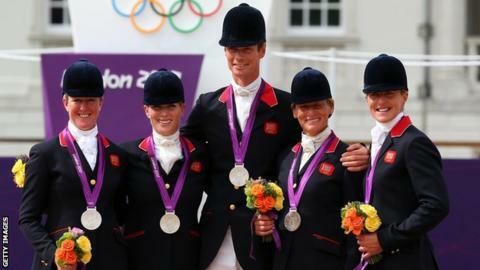 "Last year, we were a little lacking in power," said Fox-Pitt, who won individual European bronze in Malmo. "It's a bit of a transitional period in the sport, but this year I'd like to think that things are looking up. "We've had quite a long time at the top of our sport and, perhaps, now we are not as far clear at the top as we used to be." Nicola Wilson, 18th, is the next Briton behind Fox-Pitt in the world rankings, with Izzy Taylor 21st and Pippa Funnell 23rd. The United States, New Zealand, Germany and Australia each have multiple riders in the top 10. Will Connell, performance director for British equestrian sport, acknowledged GB's eventing team is "going through a period of change" and said Badminton offered the chance for new talent to prove itself. "It's more important that we get the results we need at the World Equestrian Games and Rio 2016 than it is to win Badminton," Connell told BBC Sport. "The World Equestrian Games marks the first opportunity to qualify teams for the Rio Olympics. That's our primary aim. "As it stands, Britain are not the favourites going into the World Equestrian Games, but they go in as strong contenders for a top-five team spot, which is what they need to qualify for Rio." Badminton begins with dressage on Thursday and Friday, followed by cross-country on Saturday and the jumping finale on Sunday.